What's new in beautiful smiles. About a week ago, I was asked to give a speech. A testimony. Usually, I'd be nervous, reciting the words over and over in my head, telling the butterflies in my stomach to stop fluttering so fast and worrying about possibly stumbling over my words. Not this time. I was in an abusive relationship for 13 years, and 9 of those years were spent married to him. I've used photography as my therapy along my journey, and this time, I was able to express my story vocally to a group of people ready and eager to learn more about domestic violence, and how real it is. Telling my story isn't an easy thing to do for me. What drove me to do so is the thought, the hope that if I can just reach one person and have that person understand and recognize what domestic violence is, what it does and how it affects everything around us then telling my story is worth it. I don't want anyone to experience what I have, and if I can stop that from happening, I'll tell my story again and again. I want to thank God, Eagle's Wings and the people who helped me (and continue to do so) in this journey. You know who you are. 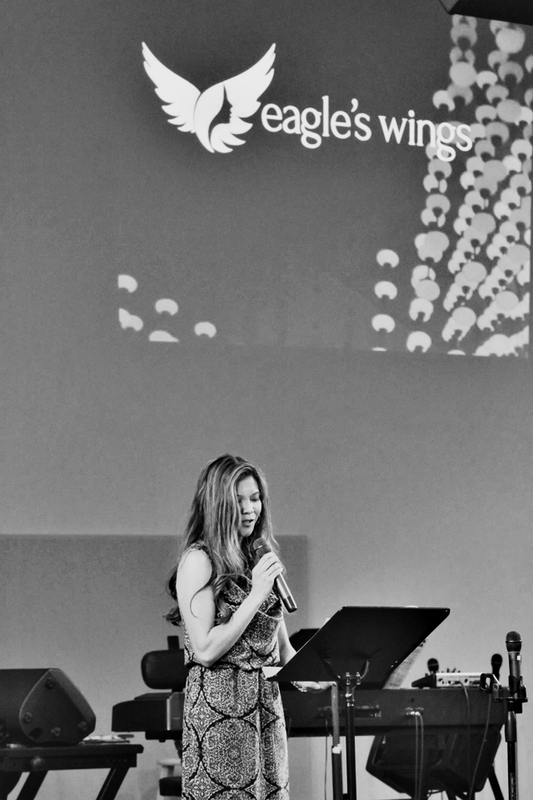 This past weekend, I was so honored to be a part of Single Mothers Outreach's annual gala, Empowering heARTS. This year, the theme was "Empowering." Ten amazing ladies were nominated because of their amazing, empowering characteristics. Each lady is paired up with an artist, who then takes the time to learn about their honoree and their story, and creates a piece based on their experiences. I had the pleasure of being paired up with Michele Buttelman, an incredible woman. Michele has been involved in print journalism for her entire career and it has played a huge part in her life story. I decided to take that angle (print journalism) and the role she plays as a liaison between the media and the community. Everything in the media can be hectic, chaotic and full of turmoil, but Michele's empowerment creates a calmness, a peacefulness that translates to the community. She is able to use the media to convey information to the masses. She is the eye of the media storm. I want to thank Single Mother's Outreach for the opportunity to be a part of this wonderful event. I also want to thank my fantastic honoree, Michele for trusting me with her life story and transforming it into a photo based on my vision. Michele wrote a short article about the event. You can see it here. I can have breakfast for lunch, dinner and well, breakfast. I consider myself a cereal connoisseur. Really. So when I had the opportunity to take photos for Ramp Creative's TypeEd Brunch, I of course gladly accepted. Sadly, cereal was not served. Type Ed offers informative classes about typography in an encouraging, creative and relaxed environment. If you'd like more information about Type Ed, please click here. I'm a list person. I make lists for grocery shopping, lists for what to pack when I'm going on a trip and even lists of places I'd like to eventually visit. But what I really need to do is make a list of people who I care about. A list that will inspire me to call, email or visit every person I think about and tell them how much I appreciate them. Because life really can end in a moment. It sounds cliché, but it's so true. I don't realize how much I take for granted until something is missing. And then I miss it so much. Too much. It makes me want to be a better person, a better friend and a better mom. I'm grateful to be able to use photography as an outlet, an escape. But when I turn the camera on myself, it forces me to face the feelings and emotions inside of me, making them real. Real for me to see. Real for you to see. I've taken some pretty personal self-portraits, and here's another one. Missing you very much, my friend. RIP Jerry. I'm lucky to have such wonderful people in my life. I thank you and love you all. My childhood was spent making snow angels, throwing snowballs and creating the biggest snowman ever. I remember school being cancelled because of the snow, and being stuck in our house because we were snowed in (which is how my Dad kicked the smoking habit...he couldn't get out to buy a pack of cigarettes!) So imagine my skepticism when my neighbor told me it was snowing outside. I called it sleet. But about 20 minutes later, she was right. It was snowing. Here, in Valencia where it's easily a scalding 110 degrees in the summer, it was snowing. I've been told the last time it snowed was 22 years ago. It snowed much more overnight and actually stuck to the ground. But not enough to make a fort. "Whoah! Look at that milk makers on that one!!" Hee hee. Very clever, Amanda. I laughed out loud when I read it. Thanks to everyone who participated and I'll let you know when we have another giveaway! This week's I Heart Faces photo challenge is: Over My Head. Or at least over little Jessica's head. She loves playing with bubbles, and while on vacation in Las Vegas, instead of braving the 110 degree weather, we decided to blow bubbles inside. Who can blame us? Yes, she splashed in the pool. Yes, she saw the bright lights the Las Vegas Strip has to offer. But this little girl was having the time of her life just by simply chasing bubbles inside the hotel room. Head on over to the I Heat Faces Web site to see more fabulous "Over My Head" photos, or click on the button below. Congrats to the Mother's Day Contest photo winner, Jennie Carey! Her photo won the heart of my guest judge (thanks, Mom!) and also won the deliciously beautiful Bird Sanctuary Cookie Box from Elenis. Now Where's That Baby Book?